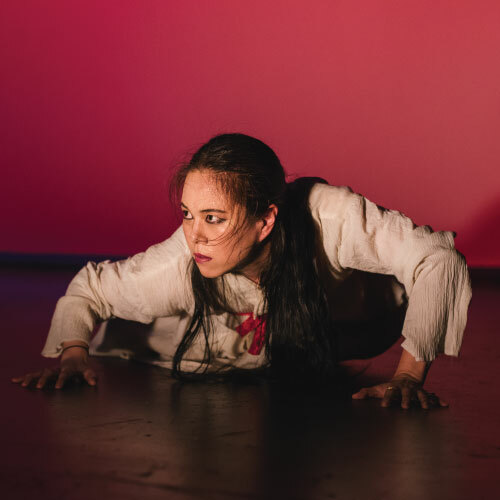 Pradhanica Dance and Music Company, led by Artistic Director and Choreographer Jin Won, explores the sonic and narrative possibilities of rhythm through dance and music. 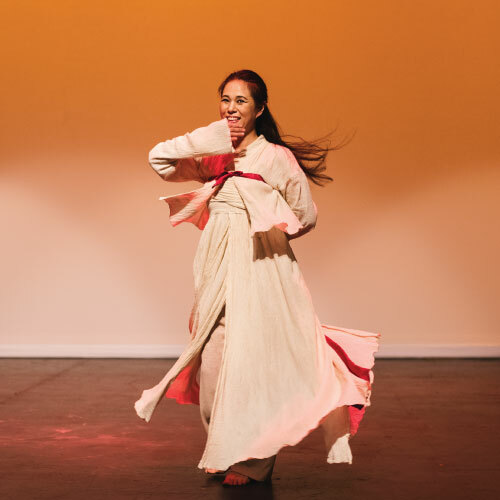 While the foundation of Pradhanica’s explorations are the Indian classical dance form of Kathak and North Indian classical music, the ensemble’s works expand beyond Indian classical arts. A kathak dancer can be as much a dancer as a percussionist. 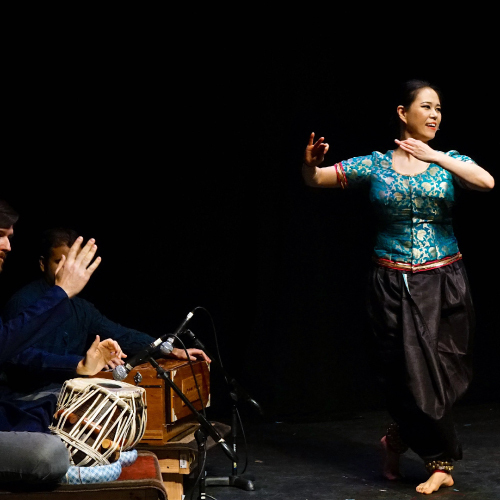 Jhankaar takes traditional kathak compositions and sets them to world percussion, while also sharing the vocal language of Indian classical dance and rhythm. 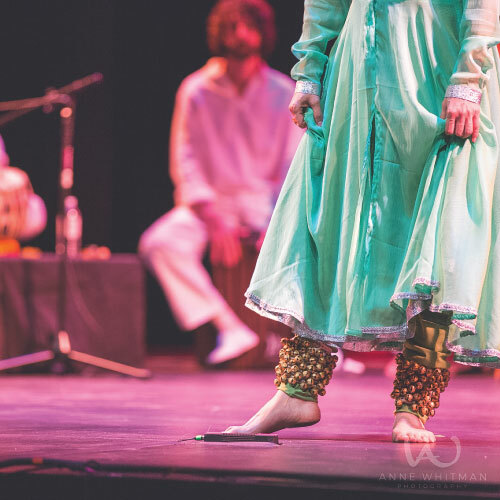 Hallmarks of kathak – intricate footwork using over 100 bells on each foot, dizzying spins, and delicate hand gestures all take centerstage, in addition to the conversations between the dancer and musicians. If the world is nothing but vibrations, can emotion be expressed through only through rhythm? If drums could speak, how would they express emotions? Composed by Pandit Divyang Vakil, Rasa shares Joy, Sorrow, Anger, and Peace. Special thanks for Mrs. Sandhya Desai for her mentorship in creating the choreography for this work. 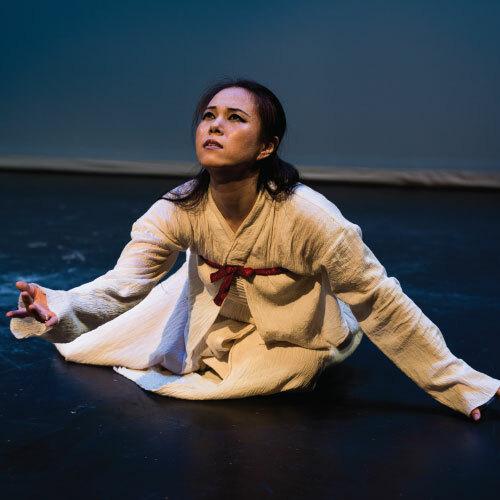 Rasa premiered at the Princeton Festival in June 2015. 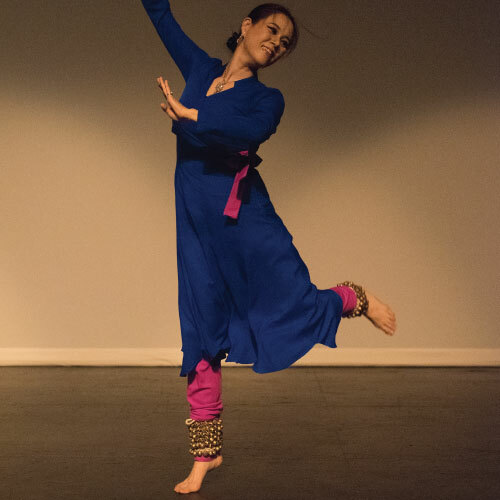 The first work by Pradhanica, Taraan takes the beauty of Kathak’s abstract movements and lines and complex Indian classical rhythmic structures outside of the framework of a single rhythmic cycle and traditional instrumentation. The essence of the dance and rhythm come together through time cycles of 6, 7, 8, and 10 in a continual flow. Composed by Indian rhythm maestro Pandit Divyang Vakil, the compositions blend the unique qualities of hand drums from around to world to create a dynamic soundtrack for this piece. Taraan premiered at the Drive East Festival in New York City in August 2013. Indian classical Kathak dance has emerged out of a community of storytellers known as Kathakaars, who would travel village to village telling the myths and legends of India. This show recreates the art form with live music and dance, where audiences of all ages can engage the traditional styles of North Indian performing arts in a fun and accessible way. The full show begins with a history of Indian storytelling focused on the lovable and playful Krishna. Following a musical interlude, the dancer concludes with an interactive presentation of technical Kathak dance where audiences learn to count in Hindi, clap rhythm patterns, and see intricate movements and spins. Projected videos will accentuate the show with colorful images of historical and present day India.